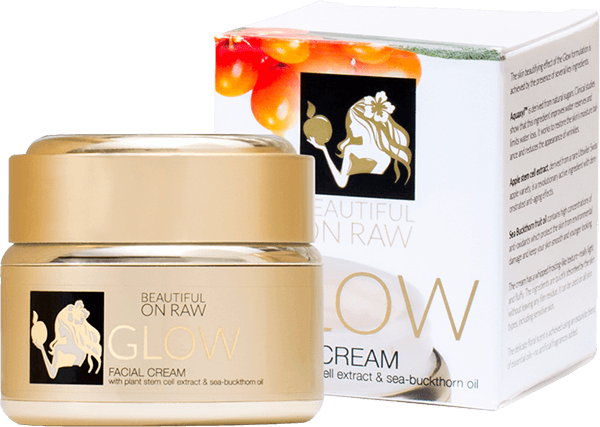 Beautiful on Raw "Glow" Facial Cream contains sea buckthorn oil, known for its amazing nourishing, regenerative and restorative properties. Coconut oil, aloe vera leaf extract and avocado oil are soothing and help to reduce minor inflammation. Mango seed butter helps to moisturize your skin, reducing dryness. The cream is suitable for every skin type, including sensitive skin and can be used as a daily moisturizer or an enriching night cream. You can apply the cream under makeup foundation or as a soothing aftershave. The goal was to find a preservative that would not harm your skin, would not introduce toxins into your body, and could be used at the smallest possible concentration while at the same time be able to prevent the risk of microbial contamination. And I did it! As a result, we are using a new Ecocert-certified, organically-certified preservative system. Ecocert, a certification body for sustainable development, is one of the largest organic certification organizations in the world. The cream has an exquisite and delicate floral aroma. No artificial fragrances used in this process, the scent was created using 100% natural essential oils. This new formulation of our Beautiful no Raw Facial Cream contains a patented, sought-after and highly reputable ingredient called AQUAXYL™. Derived from natural sugars, AQUAXYL™ helps to hydrate your skin, improving water reserves and limiting water loss by realigning cutaneous water flow to better moisturize and strengthen the skin. In simple terms, AQUAXYL™ creates a barrier through which the water in your body can not escape. It helps to defend your skin against external damage resulting from dryness, temperature or pollution. 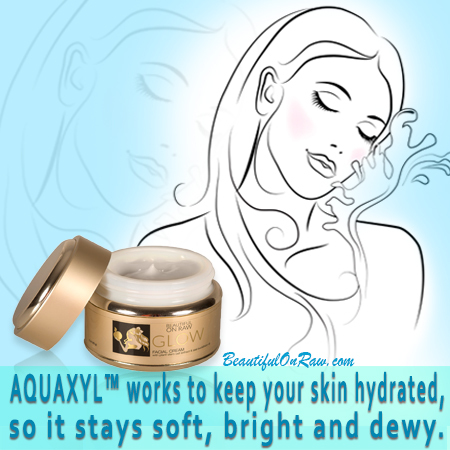 Not only is this the product that everyone with dry and/or sensitive skin has been waiting for, but AQUAXYL™ can also greatly benefit anyone who wants to protect their skin from the elements. We added plant stem cell extract taken from the Uttwiler Swiss apple, a very rare variety of apple. Research has shown promise that these extracts have properties that slow down the effects of aging on the skin, and could be the next big thing in the cosmetics industry. Ingredients: Aqua; cetearyl olivate* (olive oil derived); sorbitan olivate* (olive oil derived); coco-caprylate* (coconut oil derived); xylitylglucoside and xylitol* (AQUAXYL™); vegetable glycerin; butyrospermum parkii (shea butter); cetyl alcohol; hippophae rhamnoides (sea buckthorn) fruit oil; aloe barbadensis (vera) leaf juice*; matricaria recutita (chamomile) flower extract*; camellia sinensis (green tea) leaf extract*; olea europaea (olive) leaf extract*; prunus amygdalus dulcis (sweet almond) oil; sesamum indicum (sesame) seed oil*; simmondsia chinensis (jojoba) seed oil*; malus domestica fruit cell culture (apple stem cell) extract, tapioca starch; vanilla oil; benzyl alcohol*; benzoic acid*; sorbic acid*. Cetearyl olivate (cetearyl alcohol and fatty acids derived from olive oil) comes in the form of an oily wax. Used as a non-ionic emulsifier, it is safer than petroleum-based emulsifiers for blending ingredients in cosmetic solutions with moisturizing properties. Cetearyl olivate helps soften skin and hair, and gives the product a smooth, silky feel. For cosmetic purposes, it is mostly used in combination with sorbitan olivate. Sorbitan olivate is a surfactant based on olive oil and sorbitol, offering humectant (water-retaining) properties. Sorbitol is the alcohol form of sucrose, occurring naturally in fruits and vegetables. Not an alcohol as we commonly tend to think of it, sorbitol is a naturally derived emulsifying wax, produced from a mixture of fatty alcohols. Combined, cetearyl olivate and sorbitan olivate help mix oil and water-based ingredients and aid in softening and lubricating the skin, so it can hold in moisture. Cocos nucifera, a natural oil extracted from the dried inner flesh of the coconut, rich in essential fatty acids, is silky smooth and easily absorbed. 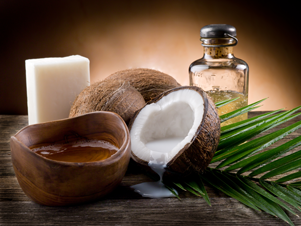 Coconut oil is one of the few sources of short-chain fatty acids such as lauric, capric, myristic and palmitic acids. This widely used skin conditioning agent creates a natural barrier against moisture loss, offering antibacterial properties that can assist the skin in repairing itself. As a skin conditioning agent, it can improve the appearance of dry or damaged skin by reducing flakiness, restoring suppleness, and slowing moisture loss. Coconut oil helps reduce the appearance of fine lines and wrinkles, helping deeper connective tissues remain supple and strong. Coconut oil imparts both short term and long term benefits, not only keeping skin soft and youthful, but aiding in exfoliation. Glycerin is a food-grade sugar alcohol derived from vegetable oil. Vegetable glycerin helps cleanse and moisturize skin, offering softening and lubricating properties. It serves as a humectant, skin protectant and viscosity-decreasing agent in our cream. Glycerin does all this by helping maintain the water balance in the skin’s intercellular matrix. 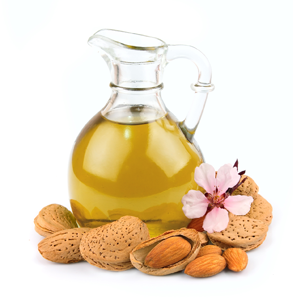 Sweet almond oil is extracted from the seed kernels of the sweet almond plant, Prunus amygdalus dulcis, a tree native to the Middle East and South Asia. This highly respected cosmetic product invigorates tired, damaged skin by locking in moisture which reduces signs of aging, especially due to thel oss of skin elasticity. Many regular users swear by it for imparting a special glow to their skin unlike anything else. Seeing the word "alcohol" may set off an alarm (drying!). Not to worry, the opposite is actually true. These "fatty" alcohols are hydrating components which are actually very beneficial for the skin. They act as lubricants by forming an occlusive or impenetrable shield/film that prevents moisture evaporation. Cetyl alcohol and other fatty alcohols keep an emulsion from separating into its oil and liquid components—hence cetyl alcohol’s use by quality companies such as Green People and Earth Friendly Baby. The Food and Drug Administration (FDA) includes cetyl alcohol on its list of food additives permitted for direct addition to food as multipurpose food additives. The safety of cetyl alcohol has been assessed by the CIR Expert Panel, who evaluated the scientific data and affirmed in 2005 that this fatty alcohol was safe for use as a cosmetic ingredient. Derived from coconuts, cetyl esters give an emollient feel and glistening glide to skin care products. The addition of cetyl esters increases the viscosity and improves stability of our Facial Cream giving it that siky feeling. Aloe vera has long been used in herbal supplements for wounds and various skin issues. It is included in our facial cream because it is an effective moisturizer for oily skin without causing irritation. It reduces chafing and keeps the skin moist to help avoid flakiness in harsh and dry weather. 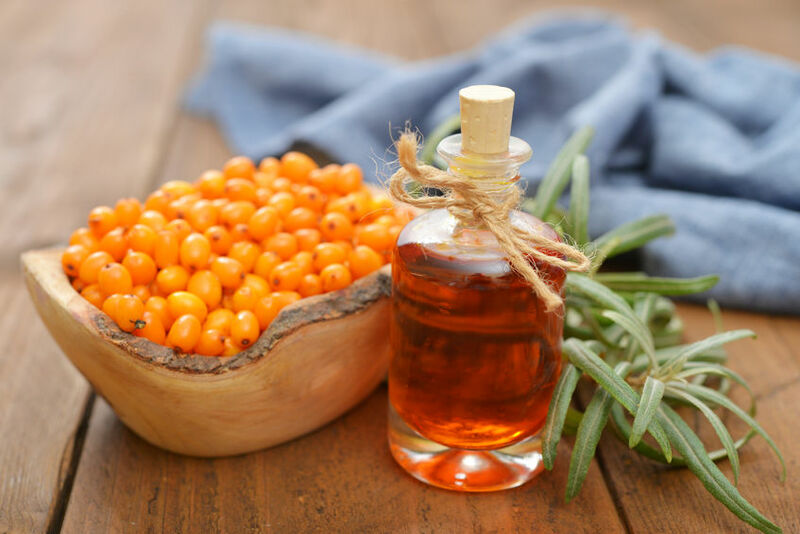 Native to mountainous regions in Siberia, Sea Buckthorn berries have been used for centuries in Asia, Russia, and Scandinavia, where it is believed to have restorative properties. The red and yellow berries of the Sea Buckthorn offer a high percentage of several essential vitamins including Vitamins C, E, and beta-carotene (pro vitamin A). The vitamin C content is among the highest for any plant. Combined, these powerful vitamins have an antioxidation effect, assisting the body's natural defense system in combating wrinkles, dryness, and other symptoms of aging or neglected skin. And this year, we have TRIPLED the amount of sea buckthorn fruit extract! 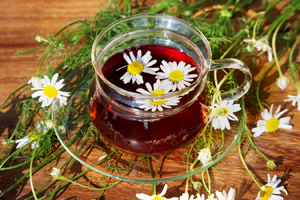 Matricaria recutita flower extract, derived from the German chamomile flower (the same one popularly used in herbal teas) has been used for centuries to cleanse wounds, soothe inflammation and reduce incidents of infection. It is excellent for sensitive and allergy-prone skin, thanks to the help of its soothing azulene compounds, which cleanse and aid in the reduction of inflammation. 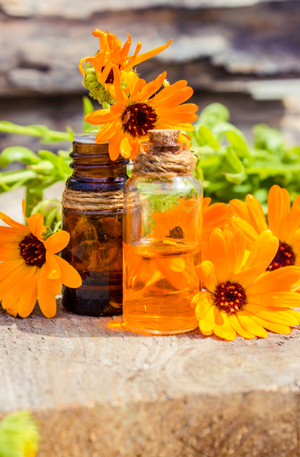 The extract of the Calendula officinalis (pot marigold) flower is hugely popular in the herbal world, and so safe and effective that it is used in natural baby products. Based on research, it has been shown to have bactericidal properties against common pathogens and has long been noted for its ability to reduce inflammation. It is invaluable in combating rough, scaly, dry skin. Calendula officinalis aids in the prevention of the formation of free radicals and helps to protect cells from their destructive effects. No skin cream would seem complete without it. Camellia sinensis leaf extract is derived from the same plant used to produce Chinese tea (not to be confused with the Australian ‘tea tree’ or melaleuca alternifolia). Camellia sinensis leaf extract possesses strong antioxidant and anti-inflammatory properties. This extract helps repair damaged cells, improving skin tone and texture. Of particular interest to current researchers is a component known as epigallocatechin gallate or EGCG, an antioxidant polyphenol found in the green tea extract which is believed to slow the skin’s aging process, acting against free radicals. 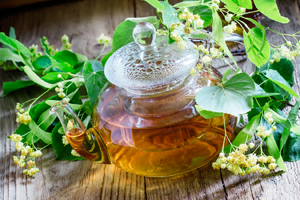 Preliminary evidence suggests that green tea extract may inhibit certain enzymes, known as metalloproteinases, which contribute to age-related deterioration of the skin matrix. The seeds of the Sesamum indicum plant are pressed to obtain a pale yellow oil rich in fatty acids that protect the skin. Among these are linoleic, palmitic, oleic and stearic acids. Up to 40% of sesame seed oil is made up of linoleic acid, which helps boost its ability to reduce inflammation and minimize bacteria. Holistically, sesame seed oil has been used for thousands of years. It has been known to offer protection from common skin pathogens, and has shown evidence of anti-fungal properties. Sesame oil components neutralize skin-damaging free radicals, and are rich in Vitamin E, which improves your skin’s beauty by nourishing, hydrating and moisturizing. The Jojoba plant (Simmondsia chinensis) contains a wealth of skin-beautifying benefits. Years ago, whale oil was used in high quality cosmetics, but after the ban on whale hunting, the search was on for a suitable alternative. Jojoba oil is perfect solution. It needs no refrigeration, does not go rancid, and is said to offer qualities that combat common bacteria. It serves as a natural, non-greasy lubrication for even the driest skin, unlike harmful petroleum or mineral oils. It leaves a rich, velvety feel that helps minimize water loss and actually enhances skin’s suppleness and flexibility. Jojoba oil is said to be wonderful for people who suffer from sensitive skin conditions including acne, psoriasis and eczema. It also serves in the reduction of wrinkles and aging lines. Moreover, jojoba encourages the growth of new skin cells and inhibits the growth the bacteria known to cause acne, reducing flare-ups. 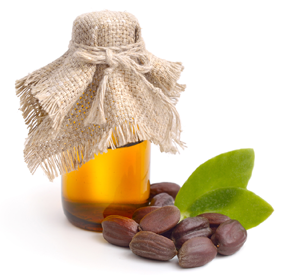 Jojoba oil is hypoallergenic and has been known to help lighten some skin marks and scars with regular use. Mango seed butter is a fat obtained from the seed of Mangifera indica, the ‘apple of the tropics’. A superb source of beta-carotene, vitamins A and E and essential fatty acids, this ingredient is ideal for improving and reducing skin dryness. Mango butter was chosen, like some of our other ingredients, for its outstanding emollient properties and its ability to reduce skin cell degeneration while restoring skin’s elasticity. Dermatologists often recommend it to prevent stretch marks and minimize fine lines and wrinkles. It is used for a wide variety of skin rashes and irritations. Mango seed butter melts at skin temperature, making it ideal for skin care formulations. It helps combat the drying effects of some soaps and cleansers, and is an excellent natural replacement for paraffin-based ingredients. This food-grade viscosity-increasing ingredient imparts a smooth, creamy feel to our already luxurious ingredients. This gel-like starch derives from the familiar tapioca plant, consisting mostly of the starches amylose and amylopectin. I do not use any artificial fragrances in my beauty products including the Facial Cream. Instead, a natural vanilla oil has been added, giving the cream such a pleasant aroma that you may just feel tempted to taste it! Ethylhexylglycerin is a compound derived from grains and plants. It is added as part of the full-spectrum preservative and antimicrobial qualities required for a superior quality product that lasts. It is a safe preservative, used in place of undesirable parabens, and is a proven preservative enhancer. It works by promoting rapid destruction of micro-organisms by reducing the integrity of their cellular walls. Another benefit is that it can be used in minute amounts to still achieve desired results, so you can see it is listed last indicating there is less of it in our cream than any other ingredient.